Perhaps it's because I'm a bit of a fanboy when it comes to '90s "shooter" games, but it's a real shame that such a fast and furious game like Amok is all but forgotten these days. The reason I say "shooter" is because while this is a third-person action game, it has a lot more in common with FPS games than its camera-behind-the-protagonist brethren. 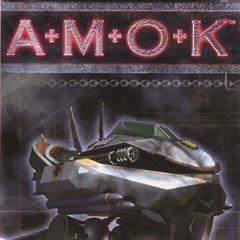 Amok was the one and only game developed by Lemon and it was released for both PC and Sega Saturn in 1996 and 1997, respectively. Kill Things. Lots of Things. First and foremost, you kill and destroy lots of things in Amok. You run around in your mech and shoot legions of bad guys and blow up all sorts of structures. The mech you control is surprisingly very nimble and although you can't jump / hover, you can circle-strafe and run to out-maneuver a wide variety of enemies. The action is incredibly fast-paced in Amok and if you aren't constantly moving, you'll soak up a fatal amount of damage in almost no time. In terms of controls, the game feels very similar to '90s FPS games. The weapon management is a little different since you have a mech that's capable of having multiple weapons equipped at once, but other than that, the game plays a lot like Quake and Duke Nukem 3D. The reason I feel this is important is because after reading through a number of reviews for the game, it seems like it was unfairly compared to the huge (no pun intended) MechWarrior games. To make matters worse, the console port of MechWarrior 2 was released right around the same time as Amok and you can imagine which one garnered the most attention. But anyways, back to the gameplay. As I mentioned, you'll be zipping around the levels and engaging with all sorts of enemies. The most common enemies are your basic grunts / soldiers. While these dudes are pretty basic, they will attempt to overwhelm you with numbers and increasingly more powerful weapons. Additionally, the game throws all sorts of other random enemies at you, such as flying bug-like creatures, weird UFO-esque robots, jumping spider things, Cthulhu-style tentacle monsters, and many more. There are also other hazards like mines and turrets that you'll have to deal with along the way. Even though the game reuses the same or similar enemies throughout, there's still a really nice overall variety that will keep you on your toes and engaged throughout. The only real disappointing aspect in terms of enemies is that there's only one boss in the game. Bummer. As you're trading blows with these enemies, you'll see their projectiles firing at you in an almost "bullet hell" kinda way. This isn't really a shoot 'em up game, but it can kinda feel that way as situations start to ratchet up the intensity. This is a rather wild comparison, but the way projectiles are handled kinda reminded me of certain segments in NieR Automata. Your mech comes equipped with four different weapons. Your standard chaingun has unlimited ammo and its usage is critical in conserving your other weapons' ammo for more difficult enemies. You can hold down the button and dispense an onslaught of bullets, which is absolutely what I did in many spray-n-pray moments. Of course it wouldn't be a mech-themed game if you didn't have some missiles at your disposal. And in Amok, you have regular missiles and heavy missiles. They're slow at reaching their target and if the enemy dodges it, you'll have just wasted a precious missile. But if you can score a hit, you can deal out some serious damage. The last weapon type is your bombs. I found these to be super handy throughout the entire game. Your first instructed to use them to clear a path through a minefield, but they proved to be a rather versatile addition to my armory. To keep things simple, Amok doesn't provide a way to manually target your enemies. Instead, you basically just point and shoot. If you get your crosshair over an enemy, it will turn from green to red and attempt to auto-aim at the target. This works pretty well with the chaingun, but I had issues with the special weapons if the target was really fast and / or far away. But like any challenging game, Amok gives you all the tools to succeed, it's just up to you to figure out how to use them. Over time I started to figure out how best to take out enemies with everything I had while still utilizing my personal playstyle. The only real complaint I have with the combat is that some of the flying enemies later in the game simply move too fast and deal out way too much damage. I struggled with some of those parts a bit more than I would have liked. The game provides a nice mission briefing that kinda lays out the terrain and tells you where to go and what to do. But once you're in the mission, it's pretty much all up to you. You do have access to a map, but I recommend paying attention to that mission briefing. Another interesting bit here is that you can actually partially complete certain objectives, which can slightly affect the next portion of the game. I've alluded to it already, but now might be a good time to say that Amok is a tough game. It only has two difficulty modes: Easy and Hard. If you play on Easy though, you only get a portion of the game. Despite the obvious emphasis on the action and the challenge it presents, Amok also does a great job of rewarding exploration. Most of the levels it provides are actually quite large with plenty of open terrain. I found that by searching every nook and cranny I would often find some sort of reward. This could be as simple as some extra ammo or as helpful as finding a full health powerup or an invulnerability shield (which is amazing if you're going to go in guns 'blazin'). Another powerup you can find is a hull upgrade. In an interesting twist, when you first start the game, you can only fill a small portion of your health bar. As you find hull upgrades, your maximum health expands slightly. If you don't explore much, I can't imagine you'd be able to max out your health by the end of the game. And trust me, you're gonna need it for those last couple of levels. But I'm sure someone who is a lot better at the game than I am will no doubt attempt a "no hull upgrade" run, and I salute them. Having a super fast-paced action game like this wouldn't really work if the engine couldn't keep up, but I'm happy to report that Amok runs buttery smooth. I experienced absolutely no slowdown or technical hiccups. Of course, that means I couldn't "blame" my console for my own mistakes, but that's okay. The engine actually uses voxel technology, which is an interesting change of pace to most early 3D games of this ilk. The graphics aren't the best or most detailed on the Saturn, but they absolutely work in this type of game. The soundtrack is also worth mentioning. It was composed by Jesper Kyd and features some pretty great '90s style industrial / techno tracks that fit the mood and setting perfectly. There's also a multiplayer mode that features both cooperative and competitive options, but alas, I wasn't able to try it out to know how well it works. If you're in the mood for a challenging, but really fun blast-fest, then add Amok to your short-list of options. It took me about 5.5 hours to play through the game, but I was fairly familiar with a decent chunk of it since I've played it many times over the years. So it's not super long, but should keep you at the edge of your seat for its entire explosion-filled ride. The only downside is that the game has almost no chance of making a revival. Both its developer and publisher went belly-up in the '90s and it's anybody's guess who owns the rights these days. It did have a PC port, so I guess there's always a tiny flicker of hope that it could release on GOG some day, but I wouldn't hold my breath. Luckily, it's very inexpensive on Saturn ($10 - $20, depending on completeness) and runs / plays incredibly well.